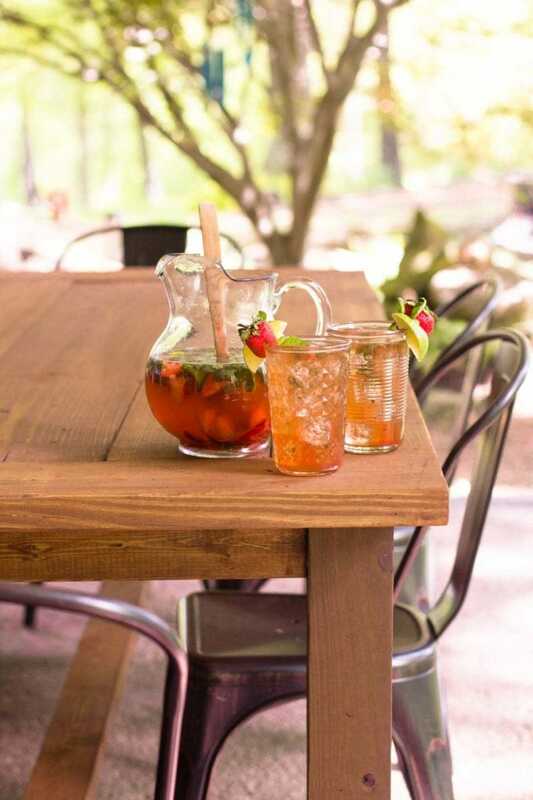 Serve these Pitcher Strawberry Mojitos at your next summer party and get rave reviews! I’m not sure I can adequately put into words how excited I am that today is here. Today, my amazing husband is graduating from college. Higher education has been a long road for him with lots of ups and downs, but today, he graduates (with honors!) with his degree in visual communications, and I couldn’t be prouder of that guy. I know college isn’t for everyone, but I had a really wonderful college experience, and I was excited when my husband said he wanted to go back to school a few years ago—I just knew it would be great for him, and oh my gosh, has it been. Of course he’s graduating with more book knowledge, but he’s also graduating with more confidence, more self-assurance, and more pride in himself than I’ve ever seen before. I’ve been a big fan of his for a decade now (duh, hence the whole marriage thing), but I think it’s been really wonderful for him to have the adoration of people who aren’t legally bound to him for eternity. He’s won awards. He’s been at the top of his class. His peers and professors respect him. I think he’s finally starting to believe he’s the rockstar I always knew he was. And it’s been amazing to watch unfold. Of course, like most last semester college students, he was about 1000% ready to be done with school weeks ago. The last semester of college is hard—especially when you’re in the midst of a thesis project—and I think he’s about half past ready to not need to stay up to 2am doing homework every night. I’m sure he’s glad he did this and checked it off his bucket list, but I think he’s also totally thrilled to be going back to normal life. Not that we know what normal life looks like. The last time Craig wasn’t a student, we were both working full time and childless. Figuring out our new normal as a family of three (without college classes in the way) is going to be so much fun this summer. We have, of course, been celebrating like crazy over the past few days. It seems like every step in these last few weeks has been something to celebrate, and I’m never one to turn down an excuse for a good cocktail, are you? His last “real” day of classes was last Tuesday, and we celebrated the end of his time in the classroom with a big ole pitcher of these strawberry mojitos enjoyed in the peace and quiet of our front porch. 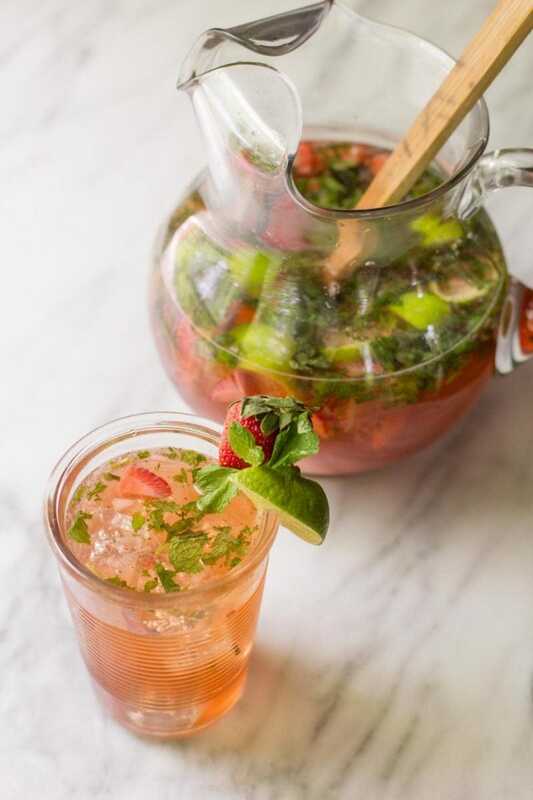 These Pitcher Strawberry Mojitos are perfect for parties or even just your regular weeknight celebrations. This recipe makes 4-6 good-sized servings (you could probably squeeze eight out of it if you serve it in smaller glasses at a party), and they are always a hit. A lot of mixed drinks recipes are SUPER sweet to my tastebuds, and I’ve never been the biggest of fan of mixing a ton of sugar with booze—that’s a recipe for a nasty hangover. 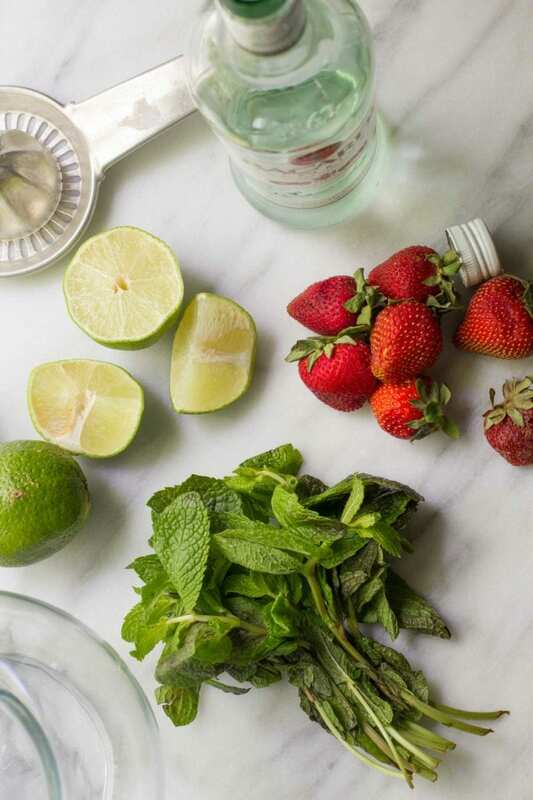 This mojito recipe is a lower sugar recipe that we just adore. I don’t mind the taste of rum, so I’m fine with cutting back on the sweetener, but if you’re alcohol adverse, you might want to play with the sweetness until it’s perfect for you. 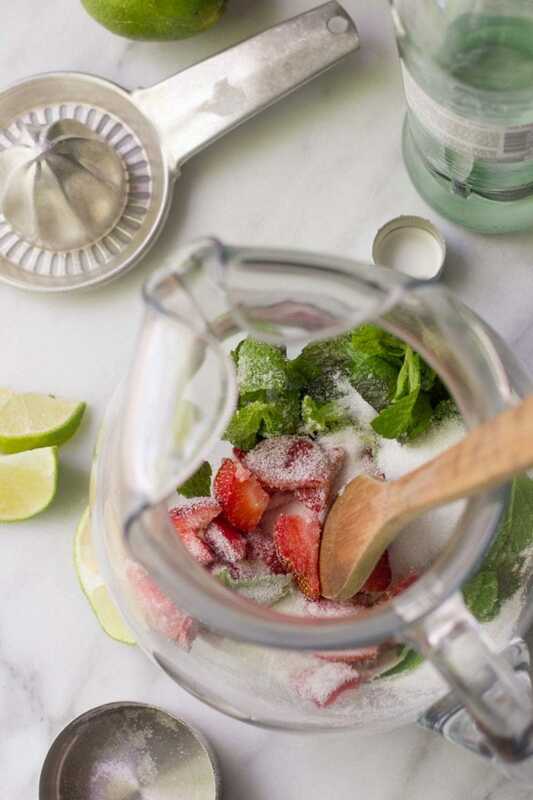 The traditional mojito flavor of mint and lime is a perfectly refreshing way to celebrate on a warm spring day, and adding strawberries gives it a little bit of fruity sweetness that is off-the-charts awesome. These things are so incredible! Craig’s family is in town this week to help us celebrate his graduation, and I plan on making these mojitos more than once this week. We’ve got some serious celebrating to do! 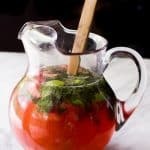 Using a muddler or a wooden spoon, mash the strawberry mixture together in the bottom of the pitcher to release the flavors. Add in the juiced lime quarters and rum. Stir until the sugar is dissolved, then add in the club soda. Gently stir to combine. Pour over ice into glasses and garnish as desired. 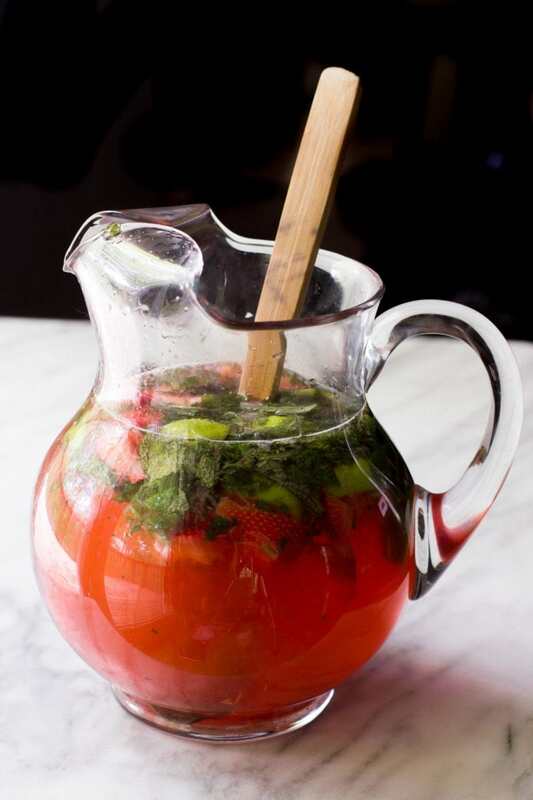 The strawberry, lime, and mint flavor only intensifies as the pitcher sits in the fridge. It’s best after about 30 minutes, but make sure to drink them within 24 hours—any longer than that, and the citrus peel turns the mojitos bitter. I’m not a huge fan of plain mojitos, but I just made Watermelon Mojitos this weekend! They were divine. I didn’t add any sugar, but otherwise was similar to this recipe. Rum, lime, mint, a whole much of cubed and crushed watermelon, some Tropicana pure Watermelon juice and a splash of club soda. SOOOO yummy. I’ll try these next time. Oh man, watermelon sounds SO awesome! I’m definitely going to have to try that when our melons start to come off. AWESOME idea! Mojitos are a perfect way to celebrate—congrats, Craig!! I just went to Puerto Rico and drank many a mojitos while I was there. Love this spin on it! Congratulations to Craig! What an awesome accomplishment. Congratulations! What an achievement for not just Craig, but for you as well. Education (once you’re married and have a family) requires commitment from everyone, so congrats to you all! 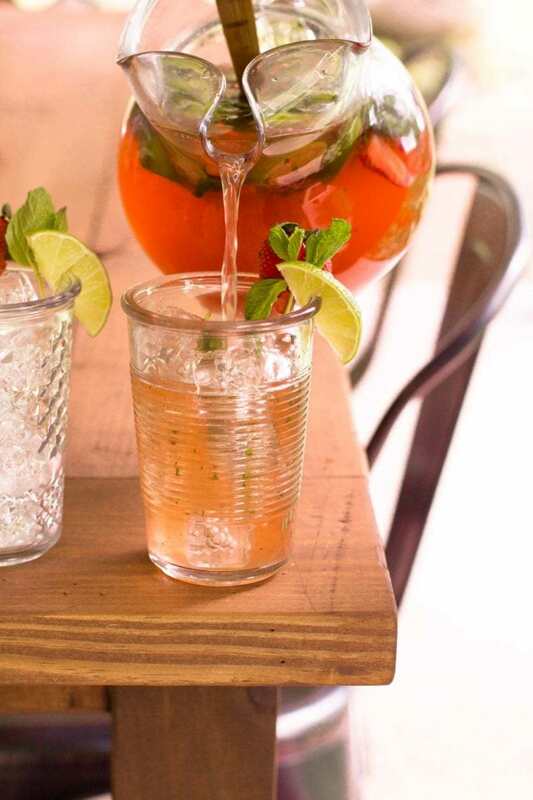 PS….Mojitos are the liquid language of love in my books, so thanks for the recipe! Cassie, congrats to Craig! What an accomplishment!! HUGE congratulations on a job very well done to your sweet hubs! Hi, this looks awesome! If I use simple syrup instead, is it the same ratio? I.e 1/2 cup simple syrup? I believe so, but I haven’t tried it. You could try starting with a little less, and slowly add until it is sweetened to your taste!